New Versions of Server and Web Access editions! Handy Backup became much faster and more resource-friendly: now it can perform backup tasks of 1 million files and more, with moderate PC memory consumption. Download easy yet full-featured backup utility for any Windows environment! Free 30-days trial version! We have created Handy Backup Console Client (comes in the installation folder as hbcc.exe) which can be used to launch, stop or delete tasks through the use of command line interface. To learn more, please see Command Line in the User Manual. 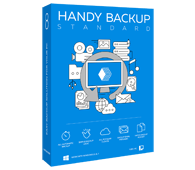 Handy Backup is slowly (but surely) becoming compatible with 64-bit platforms. Version 6.3.0 passed tests of files-based backup in various modes and made first steps to compatibility of advanced plug-ins (see below). MS SQL Server Backup plug-in has been tested and proven to work with 64-bit platforms. So, now we support 32- and 64-bit versions of MS SQL 7.0, 2000, 2005 and 2008 running under 32- and 64-bit versions of Windows 2008/2003 Server or Vista/XP/2000. Also, we have released a new version of Handy Backup Web Access which is now more stable and secure. Note: The new version of Web Access is not compatible with Handy Backup 6.2.5 and earlier, so it is highly recommended to update both programs to the latest version.